The name itself calls for attention. 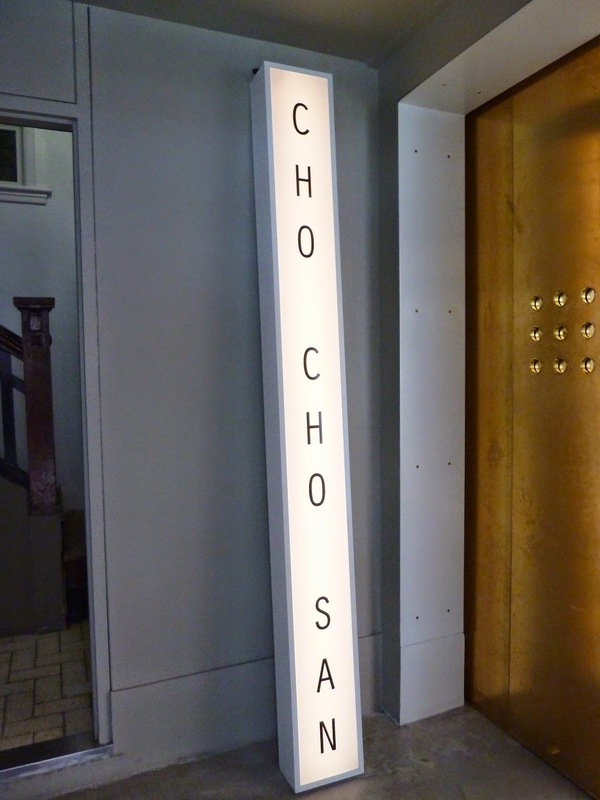 When I first read about Cho Cho San, it was the name of the restaurant that caught my eye. And after reading many positive reviews, I was keen to check it out. What's so interesting about Cho Cho San is none of the people at the helm are of Japanese origin and yet the menu is Japanese focused with a modern interpretation. The menu is divided into Small dishes, Raw bar, Hibachi grill, Others, Sweets and Feed Me Please. Silken tofu in tomato dashi - super smooth tofu with a delicious, flavourful yet subtle dashi. Very elegant broth but so good! Tempura pumpkin - the pumpkin was soft and sweet with a contrasting texture of the crunchy tempura batter. Fried chicken - a generous plate of what I would say was a very popular dish with us. The mayo went so well with the fried chicken. From the Raw bar, we chose the Petuna Ocean Trout, black pepper and wasabi. This was seriously fresh and showed the quality of the ocean trout. Loved it! From the Hibachi Grill, we had the Soy Glazed Angus Beef. Perfectly seared, with a lovely touch of pink. Deliciously salty yet tender. King Crab omelette with Japanese curry. It was a nice dish, wish I had more morsels of the crab meat but I did enjoy the Japanese curry combination. The curry sauce was not overwhelming, enough in it to give flavour to the omelette. I liked how the omelette was fried to the point where there were super crunchy bits. We had to find space for dessert. I was itching to try out the Instagram famous soft serves of the matcha kind. But the menu has changed since then and the soft serves were Banana with bits of peanut and swirls of caramel served in cones on a bed of white rice. Talk about theatrical but I loved it! The soft serve was delicious, sweet and crunchy and slightly salty from the caramel. And the nice surprise was when I got to the end of the cone, a big taste of caramel hit me then! Happy times! I am glad I was not disappointed with Cho Cho San. The food was good, authentic but yet interesting. The service was excellent. Admittedly it was above average prices but I had no issue paying for the quality of the food. The prawn rolls are very photogenic. Love the beef tataki here. Definitely one of my fave dishes here. Hurray nice dishes and i like these type of food!!!!!!!!!!! Hi Peter, thanks for visiting! mmm that fried chicken looks amazing but i reeeally want that soft serve! Hi chocolatesuze, I wouldn't mind another serve of that soft serve again! Yum!